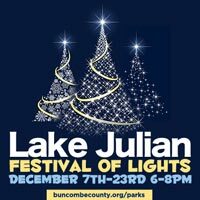 ASHEVILLE NC – Light up your Holiday nights at the Lake Julian Park Festival of Lights. The drive through show begins Friday, December 7 and is nightly from 6 – 9 p.m. through Sunday, December 23. The park is brightly lit with thousands of colored lights and over 50 animated and stationary light displays. The road circling the park becomes a magical journey through tunnels of dazzling lights. The cost for this drive through presentation is $5 for a car, $10 for a van and $25 for a motor coach. A portion of the proceeds are donated to Buncombe County Special Olympics. Lake Julian Park is located off Long Shoals Road. For information about this event, call 684-0376 or email [email protected]. Presented by Buncombe County Parks, Greenways and Recreation. ASHEVILLE NC – Lake Julian Park presents “Walking in a Winter Wonderland”* at Lake Julian Park. 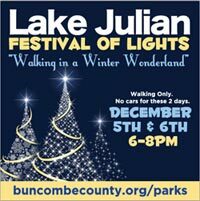 The first two nights of the Lake Julian Festival of Lights are for walkers only. Wednesday, December 5 and Thursday, December 6, Lake Julian Park will become a wonderland for pedestrians – no cars allowed! Enjoy the holiday lights from a new perspective as you stroll through the brightly lit woods. Walkers will be serenaded with live holiday music by the band Graywolf. Take time to warm yourself by the fire and toast a couple of marshmallows with the kids. Gates open from 6 – 8 p.m. Adults admission is $5 and children get in FREE! Wonderland Walkers should wear comfortable shoes, warm clothing and be prepared to walk over half a mile on a paved walkway. The walkway is of moderate difficulty with some inclines. Parents with young children are welcome to bring strollers or wagons. No pets please. Lake Julian Park is in Arden, just off Long Shoals Road. Parking for “Walking in a Winter Wonderland” is at Family of Faith Fellowship Church, 212 Long Shoals Road, Arden. For more information, call (828) 684-0376 or email [email protected]. *“Walking in a Winter Wonderland” is subject to weather conditions. Lake Julian Park reserves the right to cancel the event or close the event early without notice. ASHEVILLE NC – The Reuter Center Singers, more than 50 voices strong, present their annual holiday concert at 7:30 p.m. Monday, Dec. 10, in UNC Asheville’s Reuter Center. The concert is free and open to the public. This year’s program will include a choral medley of Irving Berlin’s most beloved Christmas songs, Douglas Wagner’s arrangement of traditional Christmas songs, the rhythmic “He Come from the Glory,” and the Jewish traditional song, “Ose Shalom” (the peacemaker). The Reuter Center Singers, a community choir based at the Osher Lifelong Learning Institute at UNC Asheville, perform in many community venues and will sing holiday favorites at Biltmore House on Monday, Dec. 17. The Reuter Center Singers are directed by Chuck Taft, who also serves as music director for Southern Appalachian Repertory Theatre. For more information, visit olliasheville.com or call 828.251.6140. ASHEVILLE NC – “Remnants of Fleeting Moments” – an exhibit of oil paintings by UNC Asheville senior Hanna Trussler, will open with a reception at 6 p.m. on Friday, Nov. 30, in Blowers Gallery, in UNC Asheville’s Ramsey Library. Trussler’s works will be on view during regular library hours through Dec. 14 in the Blowers Gallery. The reception and the exhibit are free and open to the public. For more information, call 828.251.6436. ASHEVILLE NC – The Diana Wortham Theatre in downtown Asheville presents “Winter Songs,” the third edition of the Intersections Sing Together Series, Friday, December 7 at 6:30 pm in The Forum at Diana Wortham Theatre. Led by local educator and recording musician, Beth Magill, “Winter Songs” is designed for family and friends to celebrate the joy of music and singing, learning seasonal songs to share with the entire family to further enjoy the warm holiday season. Mulled apple cider and cookies are included, and parents are invited to help their children cut out a snowflake to take home. The Sing Together Series are classes offered for parents and children in a relaxing, fun environment with other residents of the Asheville community. This series is for anyone of any age or skill level who loves to sing. No experience is required. Attendants will learn several new songs devoted to the theme of the night. The full Sing Together Series is available at www.dwtheatre.com. About the Instructor: Beth Magill is a professional flute and tin whistle musician, playing mostly Celtic/light classical and contra dance music with various musicians & bands. She is a recording session musician, teaches tin whistle to adults and children, offers workshops for parents in how to create more musical home environments for children, has written a children’s book about musical children, and teaches Musicare, a preschool music program. Having reared three very musical children herself, she adores making music with little ones and their families, and has served hundreds of children over the last eleven years by operating one of the most successful private Kindermusik studios in the North Carolina/Tennessee region. She believes that without a doubt, we are all musical, and is delighted to be able to help bring those musical gifts both adults and children possess, out into the world. For more information: www.magills.net / www.bethmagill.com. Fee for Intersections “Winter Songs” is $8 for adults and $5 for children 12 and under. Registration is not required, but highly recommended. Register by calling the Diana Wortham Theatre Box office at (828) 257-4530. For more information regarding this event, the Intersections Series, and Diana Wortham Theatre, please visit www.dwtheatre.com. ASHEVILLE NC – Student and faculty musicians from Western Carolina University’s School of Music will perform at the annual “Sounds of the Season” fundraising concert beginning at 3 p.m. Sunday, Dec. 2, at the John W. Bardo Fine and Performing Arts Center. The WCU Wind Ensemble, Jazz Band, Smoky Mountain Brass Quintet, Faculty Woodwind Quintet, Clarinet Choir, Saxophonic Quartet and Early Music Ensemble also will perform. By special arrangement, the program will close with a holiday sing-along led by Santa Claus. Reserved-seat tickets are available in advance from the Bardo Arts Center box office at fapac.wcu.edu or 828-227-2479; they are $15 for adults, $10 for faculty/staff/seniors (60 and older), and $5 for students and children. For more information, contact the School of Music at 828-227-7242. ASHEVILLE NC – The Folk Heritage Committee, the volunteer behind-the-scenes force which annually spearheads Asheville‘s Shindig on the Green and the Mountain Dance and Folk Festival, announces that it will host a toy drive for New York and New Jersey children affected by the devastating Hurricane Sandy. The drive will take place during the Asheville Holiday Parade along the parade route, Saturday, November 17 at 11:00am in downtown Asheville. Parade spectators and participants are encouraged to bring new or gently used toys with them to the parade. Folk Heritage Committee volunteers walking alongside the Committee’s float, which is entry #19 in the parade line-up, will retrieve toys for donation from the crowd along the parade route and collect them on the Committee’s float. Look for the large “Shindig on the Green” banner preceding the Committee’s float. Toys for any age group, infants through teens, will be accepted. The Folk Heritage Committee is researching organizations in NY and NJ that will distribute these toys for the holidays to families affected by Hurricane Sandy, which hit the East Coast on October 29. Widespread flooding and damage to households, businesses and infrastructure, plus losses due to business interruption, make Superstorm Sandy one of the costliest storms in U.S. history. The volunteer not-for-profit Folk Heritage Committee’s mission is to produce Shindig on the Green and the Mountain Dance and Folk Festival in order to support the preservation and continuation of the traditional music, dance and storytelling heritage of the Southern Appalachian Mountains. For more information or to contact the Folk Heritage Committee, e-mail [email protected], leave a message on the Folk Heritage Info Line at 828.258-6101 x345, or visit www.folkheritage.org. ASHEVILLE NC – For the first time ever, one of America’s cities, Asheville, North Carolina, has earned the official designation of being a Green Dining Destination. This achievement means that locals, tourists, and businesspeople can dine at a plethora of Certified Green Restaurants throughout Asheville. This accomplishment was driven by the Green Restaurant Association (GRA), Asheville Independent Restaurant Association (AIR), and the Blue Ridge Sustainability Institute (BRSI), who formed a local Coalition to encourage more environmentally sustainable practices within the city’s restaurants. This month, Asheville has met and exceeded its goal of having 15 Certified Green Restaurants throughout the city, all of which have met the GRA’s rigorous certification standards. As the 16th restaurant in Asheville recently earned its certification, the Coalition has now reached its goal of Asheville becoming the nation’s first Green Dining Destination. All of Asheville’s Certified Green Restaurant have met the GRA’s rigorous certification standards by earning at least 100 GreenPoints in the categories of food, water, waste, energy, chemicals, and disposables. Additionally, each Certified Green Restaurant has eliminated use of polystyrene foam, (aka StyroFoam), and has implemented a full-scale recycling program. “We are thrilled to be one of the Certified Green Restaurants that has helped Asheville become the nation’s first Green Dining Destination,” says Randy Tally from The Green Sage. Green-minded consumers can easily locate the continually expanding list of Certified Green Restaurants online by visiting DinegreenAsheville.com, which also features the detailed environmental accomplishments of each location. Further, on the website, diners can learn more about the environmental impact of the restaurant industry, and encourage even more local restaurants to go green. For those with mobile devices, an Asheville Certified Green RestaurantFinder mobile app is available for download at the top of DinegreenAsheville.com and will soon be accessible in the Apple and Android app stores. The app was created by Squiggle IT and features map-based and cuisine-based green restaurant searches, allowing you to identify the perfect Certified Green Restaurant in Asheville to suit your culinary mood. The Blue Ridge Sustainability Institute is a Western North Carolina non-profit that applies scientific research and advanced systems approaches to encourage fresh ideas in government and industry as well as providing practical tools for policymakers, educators, community activists, and entrepreneurs. Embracing a mission of ‘Knowledge into Action’, BRSI focuses on education, advocacy and action in support of regional, national, and international sustainability initiatives. For more information about BRSI, please contact [email protected] or visit www.blueridgesustainability.org. The Asheville Independent Restaurant Association (AIR) has a mission to unite the independent restaurant community of Asheville NC as committed to local people, local philanthropies, local businesses, local food and the local economy, with a promise to preserve the authenticity of our mountain home through genuine food and signature hospitality. For more information about becoming a member restaurant or business partner of the Asheville Independent Restaurant Association, please contact [email protected], or visit www.airasheville.org. ASHEVILLE NC – Please help make a Fairview child’s holidays bright with the gift of reading. Beginning November 5, visit the Fairview Library and select a card with pertinent information about a child (gender, grade/reading level). Purchase a book ($10 minimum retail value) for that child and return it to the Fairview Library by December 14. If you prefer, you can donate $10 and the Friends of the Fairview Library will do the shopping for you. The Giving Tree will place books in the hands of children. Please help us make this project a success. For more information, contact the library at 250-6484 or email fairvi[email protected]. ASHEVILLE NC – A-B Tech will usher in the holidays with its third annual Lighting of the Green Dec 4-18, featuring historic homes on the Asheville campus, decorated for the season. Community members are invited to ride through campus and view the lights from 6 to 9 p.m. nightly. Fernihurst, an 1870s mansion once the center of social activity for the township of Victoria, will be open to the public from 6 to 8 p.m. Dec. 7, 11, 14 and 18 for free tours, light refreshments and entertainment. This year’s entertainment will include the A-B Tech Drama Department, the A-B Tech Music Department, the A.C. Reynolds High School Madrigal Singers under the direction of Janis Dellinger Bryant and the Erwin High School choral group Glenalough under the direction of Bob Johnson. Santa will pay a visit Dec. 18 along with other family-friendly activities. You are currently browsing the Asheville NC News blog archives for November, 2012.